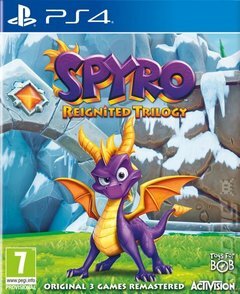 Following up on the success of the Crash Bandicoot N. Sane trilogy, Activision has once again returned to one of the 3D platforming classics with the Spyro Reignited Trilogy. Bringing together Spyro the Dragon, Spyro 2: Ripto's Rage! and Spyro: Year of the Dragon, this treasure trove of family friendly fun has been rebuilt from the ground up for a new generation of gamers. Spyro is a cuter- than-cute young dragon with a huge task on his hands. In the first game the villain of the piece, Gnasty Gnorc, cast a spell on the five Dragon Worlds, turning the elder members of the dragon families into frozen crystal, and turning all their valuable jewels into his minions. Little Spyro escaped his icy fate by simply being so small, and the spell shot right over his head. The aim of the game is to help Spyro through the five frozen Dragon Worlds, and Gnasty Gnorc s Industrial World, releasing the dragon elders as he goes along. Upon encountering any of Gnorc s minions, Spyro can either charge at them or flame em up with some hot nostril action. Everyone s favourite purple dragon returns for his second 3D adventure in Spyro 2: Gateway To Glimmer. Once again, you get to control your favourite dragon and explore a brand new hoard of crystal ridden levels. Crystals are the key here, and a certain level of exploration is required if you are bent on finding them all. Some are plain to see, others are well hidden, but you will have to spend a bit of time if you wan to excel. Uniquely in Spyro 3 there as many as six different playable characters. Since all the dragon eggs have been stolen by a mysterious villain, you re going to need all the help you can get from these extra playable characters. Good luck with this one. The huge challenge dictates that you re going to need it. For older gamers the Spyro Reignited Trilogy will be a welcome trip down memory lane, for younger players it's a chance to experience some classic platforming for the first time.